Environment • Interior secretary to focus on locally supported plans, but Utah officials wary. 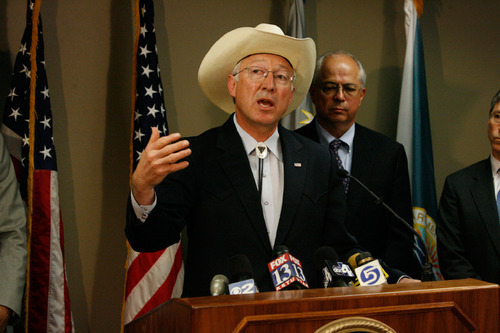 Interior Secretary Ken Salazar speaks at a news conference to announce a major bust of alleged archaeological thieves on Wednesday. 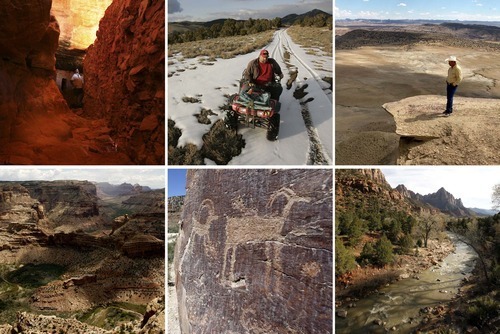 A number of people have been indicted, for reportedly looting archaeological sites in the southeast part of the state.&#xA;Rick Egan/The Salt Lake Tribune Interior Secretary Ken Salazar reversed his wild lands policy on Wednesday. Utah Rep. Rob Bishop is pushing a measure that would take away the president's ability to name any monuments in Utah without congressional approval; several fellow House members have legislation to do the same with their own states. 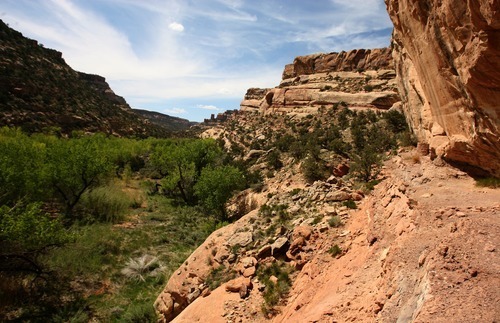 Leah Hogsten | The Salt Lake Tribune Arch Canyon in San Juan County is under consideration for wilderness designation. Interior Secretary Ken Salazar reversed his wild lands policy on Wednesday. Washington • Just a couple of months ago, Interior Secretary Ken Salazar strongly defended his new "wild lands" policy before a congressional committee as an effort to preserve sensitive areas. On Wednesday, he took it all back. Salazar said he would reverse his controversial policy, issued in December, that allowed the Bureau of Land Management to inventory and set aside swaths of federal acres that have wilderness characteristics. Instead, Salazar said he would focus on locally supported plans  and look to Congress for its input  to protect areas, a move Republicans quickly seized on as a victory over a wrongheaded policy. "I'm gratified that they finally appear to understand that Washington arbitrarily restricting the use of our public lands is the wrong thing to do," Sen. Orrin Hatch said, "especially during tough economic times and without any input from Congress or local officials." 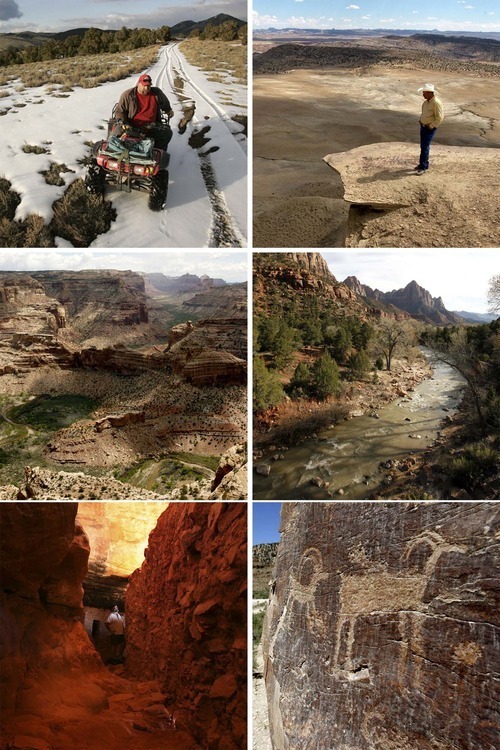 Congress had already barred any funds from being used to enforce the wild lands policy, and Utah, the Utah Association of Counties and Uintah County sued the Interior Department to block it. Those lawsuits are pending. Salazar's change of heart comes six months after he surrounded himself with outdoor enthusiasts to herald a new path forward, bypassing a Bush-era directive known as "no more wilderness." The secretary said Wednesday he would now turn his attention to gathering input from members of Congress, local officials and other interested parties in finding and staking out new wilderness areas. His memorandum did not withdraw the wild lands executive order but instead said the BLM would refrain from designating wild lands in compliance with a congressional rider that defunded the effort for this fiscal year. "The protection of America's wilderness for hunting, fishing and backcountry recreation should be a unifying issue that mobilizes us to a common purpose," Salazar said in a news release. "We will focus our effort on building consensus around locally supported initiatives and working with members [of Congress] to advance their priorities for wilderness designations in their states and districts." Such a locally driven process  similar to Washington County's effort at a compromise single-county bill that passed in 2009  is what Utah officials demanded when they filed suit against Salazar's plan in late April. "This is a win for Utah's county-by-county process, which has proven successful in identifying wilderness," Gov. Gary Herbert said in a statement Wednesday. "I have defended Utah's process in my multiple conversations with Secretary Salazar and Deputy [Interior Secretary David] Hayes, so I am pleased they are listening." The announcement marked a 180-degree turn from the Interior Department's strong defense of the wild lands policy, which Salazar said in December would ensure "that the lands of the American public are protected for current and future generations to come." William Meadows, president of The Wilderness Society, said he was "deeply disappointed" in Salazar's decision. "It's important to keep in mind that these lands belong to all Americans," Meadows said. "This apparent capitulation to opponents of wilderness protection is deeply disturbing  we hope the secretary will reassert his previous leadership in recognizing the Interior Department's responsibility to protect our most sensitive landscapes for future generations." The earlier secretarial order, while earning the praise of environmentalists, had galvanized critics of the Obama administration's public lands policies and fired up congressional Republicans, who accused the Interior Department of trying to lock up lands from potential oil and gas exploration. The GOP-controlled House Natural Resources Committee raised the issue at several hearings, and Rep. Rob Bishop, a Utah Republican who heads a subcommittee overseeing public lands, said he will watch closely to ensure Salazar follows through with his promise. "I am interested in learning more about their plans to manage lands with so-called 'wilderness characteristics,' " Bishop said. "If necessary, we will use congressional oversight to ensure the administration stays fully compliant with the law." Mark Ward, policy analyst for the Utah Association of Counties, said its lawsuit would continue against the Interior Department, though he lauded Salazar's move. "It's a reflection of the pressure that [the Interior Department] has been receiving," Ward said. "Right now, the counties are going to watch very closely how management decisions happen on the ground to make sure they follow through." Salazar's memo asserts that his department has legal authority to resume making an inventory of areas with wilderness characteristics, and Utah officials worry about where that might lead. "They seem to have left it intentionally vague," said John Swallow, chief deputy Utah attorney general for civil matters. In fact, the memo says the Interior Department won't designate wild lands "pursuant to" the congressional rider, which lasts only this fiscal year. Attorneys and the governor's staff will meet to determine what effect the policy change will have on their lawsuit, he said. In the meantime, he called it "a big win for the state." "We believe his [initial] order was unlawful," Swallow said. Supporters of the wild lands policy have pointed to the BLM's authority to manage lands, including for conservation. When the state sued, University of Utah law professor Robert Keiter said he thought that authority was enough to put Salazar's plan "on fairly firm footing." On Wednesday, Keiter said the secretary's change might enable the Interior Department to argue that a judge should dismiss the case. "A court would be unlikely to consider a challenge," Keiter said, "unless some sort of action was taken on the ground" to protect wild lands. Heidi McIntosh, associate director of the Southern Utah Wilderness Alliance, said Salazar's memo reflects the "reality" after "strident anti-wilderness" lawmakers killed wild lands funding for this fiscal year. "Wilderness advocates [will] continue to work hard to make sure that funding is restored," McIntosh said, "and when that happens, we expect the Interior Department to live up to its duty to protect deserving wilderness lands." tburr@sltrib.com Brandon Loomis contributed to this story.